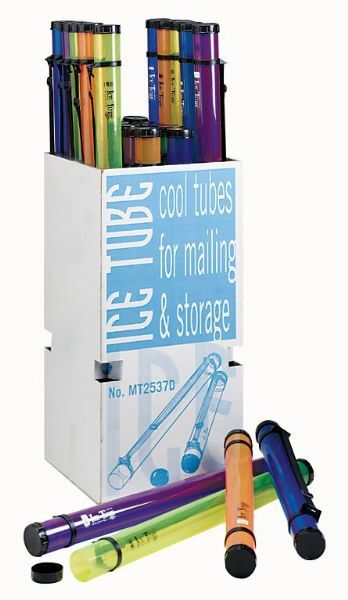 3 MT25-BL Alvin® Ice Tubes Blue Storage & Transport Tube – 2 3/4" I.D. x 25"
2 MT25-GR Alvin® Ice Tubes Green Storage & Transport Tube – 2 3/4" I.D. x 25"
3 MT25-OR Alvin® Ice Tubes Orange Storage & Transport Tube – 2 3/4" I.D. x 25"
2 MT25-PR Alvin® Ice Tubes Purple Storage & Transport Tube – 2 3/4" I.D. x 25"
3 MT37-BL Alvin® Ice Tubes Blue Storage & Transport Tube – 2 3/4" I.D. x 37"
3 MT37-GR Alvin® Ice Tubes Green Storage & Transport Tube – 2 3/4" I.D. x 37"
2 MT37-OR Alvin® Ice Tubes Orange Storage & Transport Tube – 2 3/4" I.D. x 37"
2 MT37-PR Alvin® Ice Tubes Purple Storage & Transport Tube – 2 3/4" I.D. x 37"
37.5" x 18" x 18"